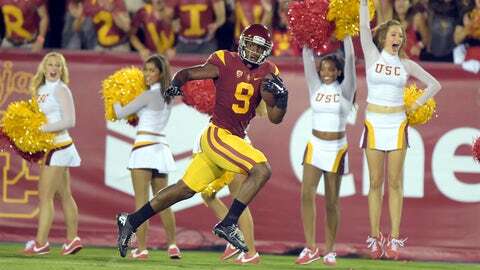 JuJu Smith-Schuster (pictured) has been Kessler's favorite receiving target in 2015. USC quarterback Cody Kessler is not shy about picking favorites. Last season, he threw to Nelson Agholar for 104 receptions. His next target had just 54 catches. In 2015, Kessler has targeted Smith-Schuster for 27 receptions. The number two receiver has only 13 catches. But perhaps Kessler’s favoritism is beneficial for USC’s potent offense. According to ESPN’s Kyle Bonagura, Kessler has completed 87.2% (34-of-39) of his passes when targeting Smith-Schuster of Jackson. They’ve combined for seven of Kessler’s fifteen touchdown passes. That’s more TD’s than dropped passes. When targeting Juju Smith-Schuster or Adoree' Jackson, Cody Kessler has completed 87.2 percent of his passes (34-of-39). Kessler is 89-of-122 (73%) to all receivers during his 2015 campaign, through four games.